Ascending Butterfly: Win the Slanted Butterfly Sterling Silver Cubic Zirconia Necklace from Jewelry Payless! 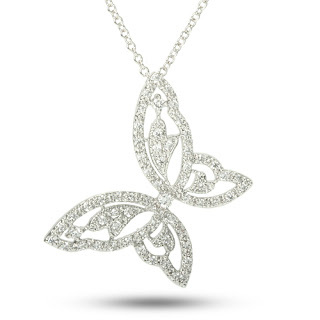 Win the Slanted Butterfly Sterling Silver Cubic Zirconia Necklace from Jewelry Payless! This giveaway is now CLOSED. Thanks so much to our wonderful sponsor Jewelry Payless! We look forward to working with you again! The winner is FDP 4 Life. Congrats!Remember: There are great giveaways active on the upper right hand side of the page! You all already know I'm butterfly obsessed. You know how much they mean to me, and what they have always symbolized for me. I have amassed quite a butterfly collection, from bags, to clothing to Jewelry. Each one is vastly different, unique and special to me. Sometimes a piece of jewelry we wear dazzles us, sometimes it dazzles others, and some pieces do BOTH! Have you ever worn a piece and had tons of people stop you and ask you where you got it and you have to touch it because you forgot what you put on that morning? I am wearing a piece right now that falls into the category of dazzling BOTH, me and everyone who has seen me wearing it! It starts with the presentation, it arrives in a robins egg blue color box, and we all know why that color box makes a girls heart skip a beat, and then inside the box is a dazzling butterfly, beautifully designed and covered with sparkling cubic zirconia stones. The slanted butterfly pendant made from sterling silver measures 1.5" in length and width! It is not small, and it dazzles like Diamonds, with a price point that is way more affordable! It's funny that even though wearing Butterfly Jewelry has become somewhat of a trademark with me, and many people have come to expect it, yet people still notice a new piece, and this one has certainly garnered a fair share of attention! I will say that I felt the pendant was substantial enough for me to change the rolo necklace it comes with, I opted to switch it to a more substantial necklace. But that's entirely personal preference, and it's not that the chain it comes with was not sturdy because it is. I just prefer thicker and longer chains, especially when the pendant is a true pendant, and not a charm disguised as one! I love that it's designed to be worn slanted and not straight, it's truly closer to a butterfly taking flight, which would make it an 'Ascending Butterfly', and you know I HAD to point that out! I absolutely love this feature about the design. The cubic Z's set against the shine of the sterling silver, really gives it a 'diamond set in platinum' look, that has made everyone do a double take! Some people even told me they were going to take up blogging if it paid in Diamonds! When I point out how affordable Jewelry Payless is everyone is amazed! Jewelry Payless has been in business for over 9 years and they have a generous 90 day warranty on all items. They are constantly adding brand new and exciting products that can be found by clicking on the New Arrivals page HERE. Jewelry Payless makes our Mother's Day Buying Guide as pick # 8. There is something for everyone with any budget/price point. Importantly, gifts that are personal and thoughtful. Mom would approve of the prices, and still be touched by the thought and meaning put into selecting a piece just for her. Ƹ̵̡Ӝ̵̨̄Ʒ - WIN IT! - Ascending Butterfly and our friends at Jewelry Payless would like to provide one lucky winner with the opportunity to win the Slanted Butterfly Sterling Silver Cubic Zirconia Necklace! (ARV $33) - Note this piece is currently on sale, it's regular retail price is $70! Ƹ̵̡Ӝ̵̨̄Ʒ - Chain Length: 16" - 18"
Ƹ̵̡Ӝ̵̨̄Ʒ - This product and many of Jewelry Payless products have a Rhodium Finish that protects the silver from tarnish. All of their sterling silver products come with a 925 stamp to indicate authenticity. If you can't wait to find out if you won and want to nab this pendant NOW, (and who can blame you!) you can do so HERE! Don't you just ♥ Jewelry Payless? I know I do! Ƹ̵̡Ӝ̵̨̄Ʒ - How to Win: (1) You must be a PUBLIC follower of Ascending Butterfly to be eligible for this and all giveaways. Indicate in your entry that you follow (if your 'comment name/user id' differs from your profile id, please let me know what name you follow under) and (2) Visit Jewelry Payless - and post the URL of another item other than the giveaway item and suggested items featured of course, as your comment entry! Please post the LINK, not the name! (3) You must also leave your email address somewhere in your comment. (You can format it this way for security, example: ascendingbutterfly AT mail host DOT com, If it is visible in your profile, just say so, that's OK!). Please follow the easy 1, 2, 3 steps to winning! This giveaway is open to USA residents who are 18 years of age or older. I follow publicly and I also like the http://www.jewelrypayless.com/Circle-of-Brilliance-Cubic-Zirconia-CZ-Sterling-Silver-Dangle-Earrings-P106385.html earrings. Entered the Helena de Natalio giveaway. I follow on GFC. Here is the link to my favorite. Hello, I'm a blog follower = trishden and I like this item http://bit.ly/9KkeuR. Thanks for a great giveaway! I belong to Ascending Butterfly's Community Group. I love the Vintage Style Sterling Silver 4 Stone Amber Necklace! I absolutely love the http://www.jewelrypayless.com/Slanted-Butterfly-Animal-CZ-Silver-Fashion-Necklace-and-Earrings-Jewelry-Set-P106545.html. Entered Spring Into Bags' Special Feature - Win the Helena de Natalio “Belen’ Shoulder Bag!giveaway!! It is absolutely it's own type of statement necklace! oops I forgot to put the rest of my entry in the last post. Please disregard that one. I Follow @JewelryPayless on Twitter. I also love butterflies--they represent new life to me! Follower, I love the http://www.jewelrypayless.com/Circle-of-Brilliance-Cubic-Zirconia-CZ-Sterling-Silver-Dangle-Earrings-P106385.html Thanks! I'm a follower and my email is in my profile. I like the http://www.jewelrypayless.com/Sterling-Silver-Bubble-Bezel-Sapphire-Blue-Clear-CZ-Tiffany-Style-Bracelet-P104822.html. Thank you!! I follow your blog. I love the Chanel Inspired Silver Black Rose Ring! I follow Jewelry Payless on YouTube. I joined your Spruz community. i follow JewelryPayless on twitter - js22222222 .